After leaving the station, many visitors to Brighton walk south along Queen’s Road. Whilst the twittens running parallel are a real delight, Queen’s Road is an embarrassment due to the poor buildings which replaced several gems of old. Goldstone Villas in Hove is thankfully somewhat of a different story. Goldstone Villas was originally known as ‘Station Road, Cliftonville’. This made perfect sense as it led to Cliftonville Station. The road later became ‘Goldstone Villas Road’ and then simply ‘Goldstone Villas’. 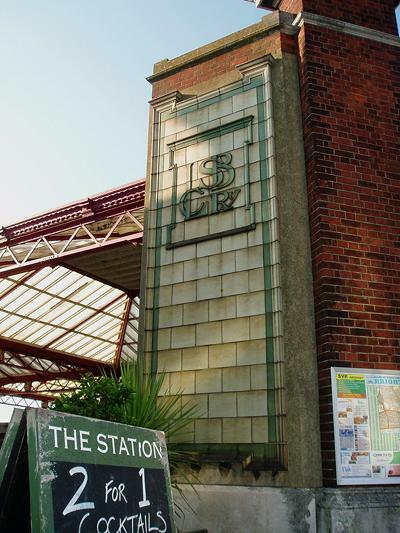 The name of the station was changed in 1879 to ‘Hove & West Brighton Station’. The Hove Station of today opened to the west in 1893 and is in fact the third station to be built in Hove. Of particular note is the cream and green tiled wall on its south side which states ‘LBSCRy’ (London, Brighton & South Coast Railway). The first station was at the top of Holland Road. The closest building to Hove Station is a pub called, rather imaginatively, ‘The Station’. It was originally called the ‘Cliftonville Hotel’ and was once thought to be one of the finest buildings in Hove due to, in part, its ornate interior. 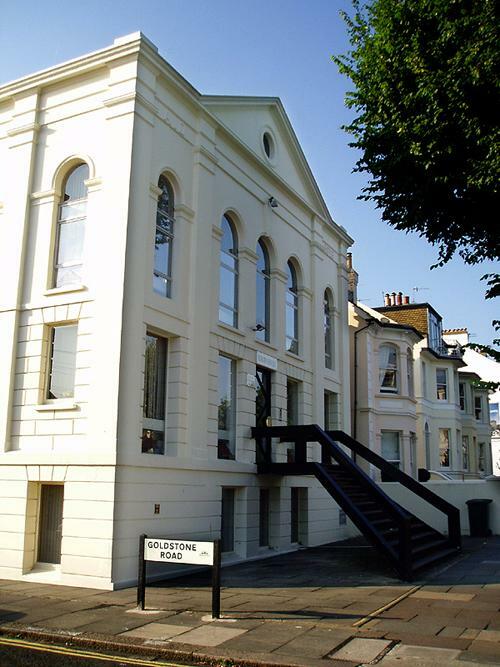 Goldstone Villas was developed from the 1870s and has several rather special buildings along its length. Most of the buildings, in various combinations, have four storeys with either yellow brick or rendered facades. The most interesting structure on the road for me is about half-way up on the west side. It has pleasing Classical proportions and was built in 1873 as the Nonconformist Meeting Hall. The prettiest house on the road is on the east side and stands out on account of its flint facade. The Goldstone itself is a large stone that was placed in Hove Park in the year that it opened, 1906. It was unearthed in 1900 having been buried in 1834 by a farmer who had wanted to stop sightseers from crossing his land to see it. Many believed that it was a Druidic altar with holy powers. It has given its name to several other roads locally and was also of course the namesake of Brighton & Hove Albion’s rightful home, the Goldstone Ground. Goldstone Villas is a beautiful road but two buildings on its east side slightly let it down. The non-descript Stone Court and the factory-like Cliftonville Court should both be demolished as soon as possible, preferably with the developers inside!